Many times, we need to add comma separated values in a text box from autocomplete TextBox to fulfill the particular requirement. Let's say, we have one page to send the emails. Then consider, we want to send emails to multiple recipients with cc and emails Id's from coming from database using autocomplete TextBox. 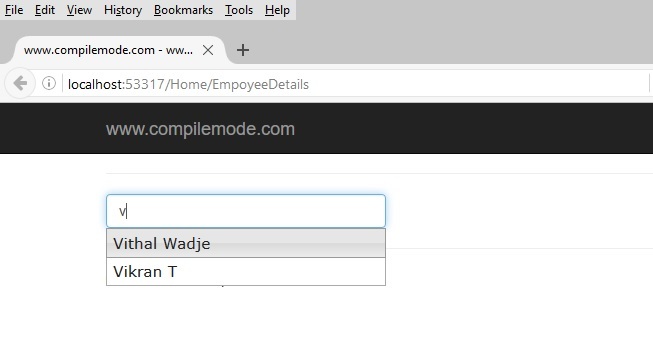 In this type of scenario, we need a comma separated autocomplete TextBox .Let's start implementing this scenario by creating one simple ASP.NET MVC application, step by step . Go to "Start" --> "All Programs" --> select "Microsoft Visual Studio 2015". After clicking on Add button, it will show the window. Specify the Controller name as Home with suffix Controller. Note: The controller name must have a suffix as 'Controller'. //Searching records from list using LINQ query. In the preceding code, instead of going to database for records, we are creating the generic list from model class and we will fetch records from above generic list. We can get same records from database as well. In the preceding procedure of adding references of libraries into the project, 1 & 3 steps don't require the active internet connection but if you are following second step, it requires active internet connection to load the CDN library's references into the project . 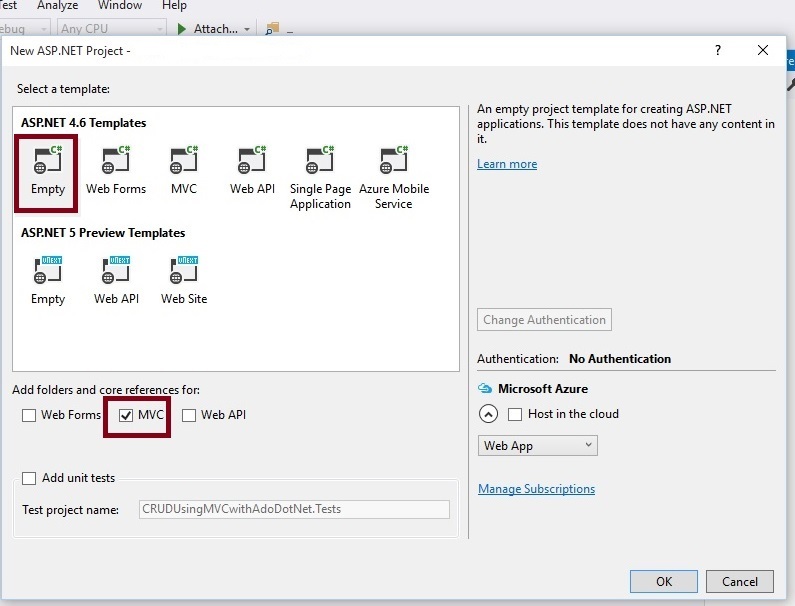 Step 5: Create jQuery Ajax function. 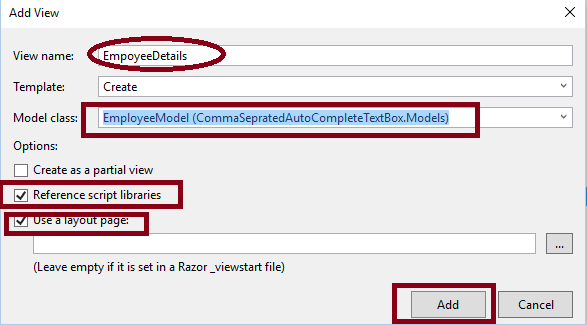 To call controller JSON action method and invoke autocomplete function including for comma separated search text, write the following jQuery function . Note: To work preceding function, don't forget to add the reference of the following jQuery UI libraries into the project by CDN or by downloading. 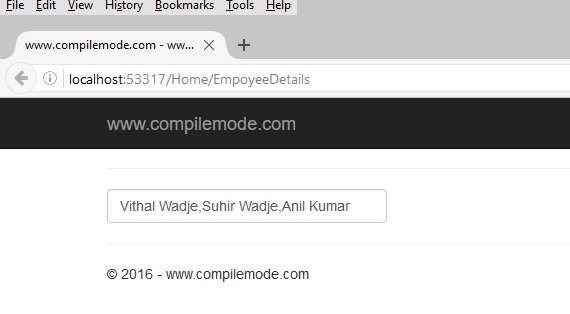 Now, let's create Strongly Typed View named EmployeeDetails from EmployeeModel class. Now, after selecting the particular records, it is added into TextBox with comma. Now, type another initial letter and it will popup the list of records. Now, add multiple records with commas. The TextBox will look like as follows. 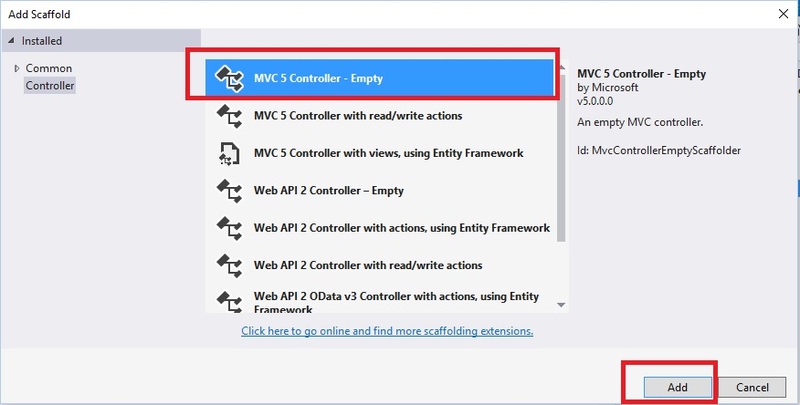 From all preceding examples and explanation, I hope you learned how to create the comma separated auto complete TextBox using jQuery UI in ASP.NET MVC. Since this is a demo, it might not be using proper standards. So, improve it according to your skills. I hope this article is useful for all the readers. If you have any suggestions, please contact me.